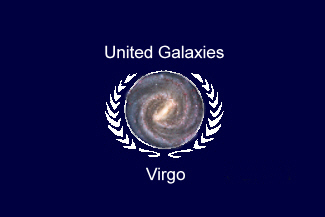 The United Galaxies Of Virgo (UGV) is a confederation of galactic governments that is a Municipalist Constitutional Libertarian Republic which is basically a representative democracy. It's the central government for a collection of galaxies which includes the Milky Way Galaxy which hold the capitol Earth. The precise capitol is Capitol City located in the Pacific Island District Of Oceania (a man made island). The territory of the UGV is roughly one fourth of the Virgo Supercluster although much of it has yet to be explored. The UVG itself has the least amount of power as it operates in a reverse power structure where the sovereign citizens and their municipalities have the greatest power. Those municipalities including sub-governments and all governments above them are considered sovereign and have their own Constitutions. The government is very limited and generally laws only apply to protect people's rights and causing harm to others. Since an economy and money no longer exist there is no corruption in government since there's nothing to gain for anyone. It's a government of volunteers who really want to serve the public interest. Copyright © 2000-2014 GalaxyFleet.Com All Rights Reserved.